Tomorrow, 8/1/11, at 9:00 PM we will go before the Warren County Department Of Land Preservation in Oxford, New Jersey.to apply for a grant to rebuild the Riegelsville Station. A STRONG SHOWING OF PUBLIC SUPPORT IS NEEDED! 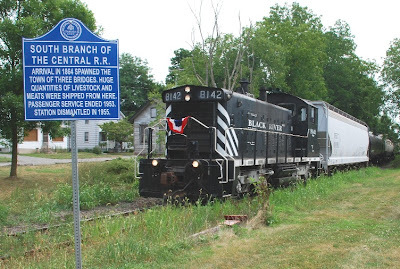 Tomorrow night, 8/1/11, at 9:00pm we will be making a presentation in front of the Warren County Department of Land Preservation as we are applicants for a grant to reconstruct the Riegelsville station. The construction of this station would be significant for both Pohatcong Township and our railroad. It would mark the far south end of our line, and also provide space for the Pohatcong Historical Society.The meeting tomorrow will be held at 500 Mt. Pisgah Avenue, Oxford New Jersey. We have been requested to make a strong showing of support. If you are able, please stop by so that the directors can see how important this is to our members and the community. The following are three "lost" railroad movies that historians would like to locate for preservation. Anyone with information about these films please email John Kilbribe, President, Camden & Amboy Railroad Historical Group at jktrr@msn.com. Also, feel free to copy and re-post or email to anyone you think can help find these films. 1. Title of the first I think is, "One Minute's Wait," a hilarious movie of only about an hour, made in b&w in the UK (in I believe the early 1950s) about a little narrow-gage train in Ireland that's about ready to depart a tiny Irish station in the bog country. But, over & over again, some absurd or LOL incident occurs (among the funniest - an escaped dog, the pet of a boarding passenger; misplaced luggage; and perhaps the sotted engine crew in the pub inside the depot [it's Ireland] -- after about a half-dozen of these delays). And so, time & again, the stationmaster on the platform hollers in Irish brogue, "there'll be just one minute's wait," with ever-increasing frustration. There's a snooty & arrogant English couple riding in the last and only 1st-class car on the little train who become the butts of much of the humor -- even at the very conclusion of the film: in a 5-second shot, a hand (you only see the hand) of a railway man closes the vacuum brake line and quietly pulls the pin on the last car ... in the following & last shot, the train tootles off, leaving the snooty English couple behind (remember, it's Ireland), and "The End" (looking of course at the receding "new" rear end of the train) ... and, roll the post-film credits. 2. The second, and I'm pretty sure of the title, "A Steam Train Passes," made in color in Australia, in I believe the 1970s. It's an historical documentary style re-creation (about 30 minutes long, if I recall it right) using fully authentic period yard & engine house scenes, scenics, stations, and costumes of the 1940s during WWII. The storyline revolves around a day in the life of a streamlined, bullet-nosed, coal-fired Pacific - steaming in the roundhouse, its crew arriving in the pre-dawn & getting the fire up for a run, warming coffee or tea on the backhead, taking coal & water, getting its train as the sun rises, and running thru the countryside (gorgeous long shots, shots from the locomotive, shots of the loco from the loco, and pan shots), while stopping at stations for passengers leaving or getting on, some of whom are Aussie soldiers. At the last, the loco rolls slowly with its hostler into its roundhouse stall and to the engine house crew's care well after dusk. There's no narration, and there's not much dialogue you can actually hear - just the sound of conversations (in the roundhouse, in the cab, in waiting rooms, aboard the train, on platforms) that are just far enough away or masked by other natural or train and depot sounds, such that you can't make out most of the words. Even friends in Australia can't place it. It's a drop-dead gorgeous film, and a real "time-machine." 3. The third film is a silent movie that featured a trip on the Camden and Amboy. It was named something like "My Train Voyage", and was very funny. Believed to have been shown at the Museum of Modern Art in New York about 20 years ago. 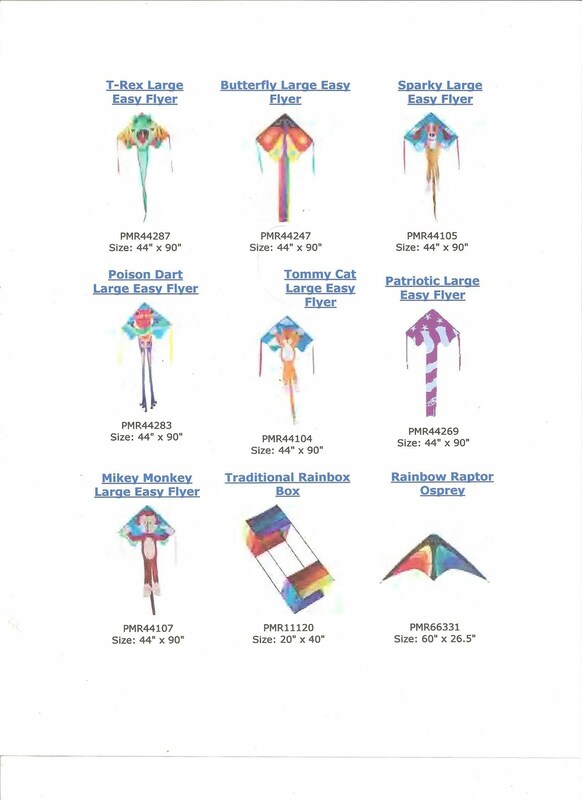 In addition to trains, planes, ships, etc., we have KITES. Kites can be great fun on vacations or weekend get-aways, or just about anytime. We have a wide selection of high quality and reasonably priced kites from Premier that will be the hit of any summer excursion. 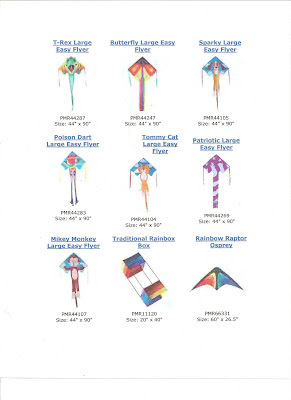 A "must have" activity for the beach but also at home or with any vacation outing, kites are classic way to make great memories with everyone in the family. Stop in and check out our selsection; and if you don't find what you want, we can special order one for you. 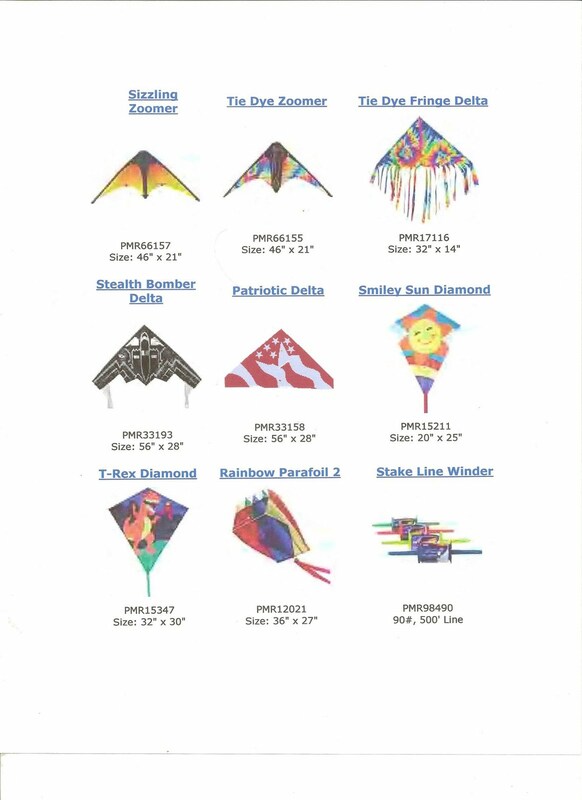 Below are pictures of the kites available from Premier. Note: you can click on either picture to see it enlarged. Then use your browsers BACK button to return here. NORFOLK, VA. - Robert A. Bradway has been elected a director of Norfolk Southern Corporation (NYSE: NSC), Chairman and CEO Wick Moorman announced today. Bradway has been president and chief operating officer of the biotechnology company Amgen since May 2010. He is responsible for the company's global commercial operations, manufacturing operations, information technology, global government affairs, and worldwide compliance and business ethics organizations. Bradway joined the company in 2006 as vice president operations strategy and became executive vice president and chief financial officer in April 2007. Prior to joining the company, he was a managing director at Morgan Stanley in London where he had responsibility for the firm's banking department and corporate finance activities in Europe. Bradway joined Morgan Stanley in New York as a health care industry investment banker in 1985 and moved to London in 1990 where he served as head of the firm's international health care investment banking activities until assuming broader corporate finance management responsibilities. Bradway holds degrees from Amherst College and Harvard University. 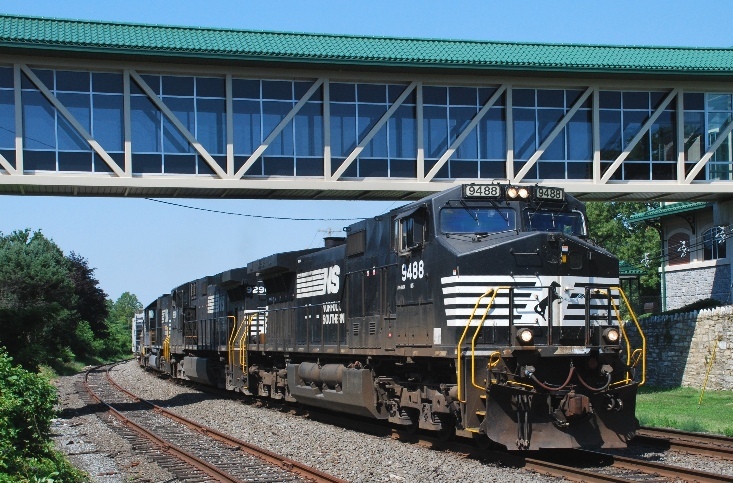 NORFOLK, VA. - Norfolk Southern Corporation announced that its Board of Directors today voted to increase the regular quarterly dividend on the company's common stock by 7.5 percent, or 3 cents per share, from 40 to 43 cents per share. The increased dividend is payable on Sept. 10, to stockholders of record on Aug. 5. Since its inception in 1982, Norfolk Southern has paid dividends on its common stock for 116 consecutive quarters. · Net income increased 42 percent to a record $557 million. · Diluted earnings per share rose 50 percent to a record $1.56. · Railway operating revenues increased 18 percent to $2.9 billion, a second-quarter record. · Income from railway operations improved 19 percent to $875 million, a second-quarter record. · The railway operating ratio improved to 69.5 percent, a second-quarter record. NORFOLK, VA. - Norfolk Southern Corporation today reported record second-quarter net income of $557 million, 42 percent higher compared with $392 million during the same quarter of 2010. Diluted earnings per share were a record $1.56, up 50 percent compared with $1.04 per diluted share earned in the same period last year. These results reflect favorable, non-recurring income tax-related benefits totaling $63 million, or $0.18 per share. "Norfolk Southern delivered excellent financial results in the second quarter, setting all-time records for net income and earnings per share, as well as second-quarter records for revenues, operating income and operating ratio," said CEO Wick Moorman. "We're seeing opportunities in the global economy, and we are moving forward with initiatives to drive business growth, productivity, and efficiency across our company." Railway operating revenues increased to $2.9 billion, a second-quarter record, up 18 percent compared with the same period of 2010, primarily as the result of a 14 percent increase in revenue per unit. General merchandise revenues were $1.4 billion, 12 percent higher compared with second-quarter 2010 results. Coal revenues increased 28 percent to $893 million compared with the same period last year. Intermodal revenues were $540 million, 20 percent higher compared with the second quarter of 2010. Railway operating expenses for the quarter were $2.0 billion, 17 percent higher compared with the same period of 2010, primarily due to increased fuel expenses and compensation and benefits costs. Income from railway operations set a second-quarter record, climbing 19 percent to $875 million compared with the same period last year. The railway operating ratio improved to 69.5 percent, a second-quarter record, compared with 69.8 percent during second-quarter 2010. ...was out in the Elizabethtown and Hershey area on Sunday after watching the Harrisburg Senators lose to the Akron Aeros in a baseball game by the score of 11 to 5. On the drive back home, our route took us into Elizabethtown where I had an opportunity to check out Amtrak's station renovations. Work has been completed and was very well done. In my opinion, it is one of the nicer stations to be seen along this corridor. While I was there, Amtrak's Keystone Service train 664 made its stop on the way to Philadelphia. Amtrak 936 could have used a run through the wash rack. Next stop would be Hershey (mmm... real good chocolate!) where I managed to catch NS 10N (Conway, PA to Allentown, PA) general merchandise freight. NS 9488 and two other unidentified diesels were bringing this mixed consist east. There were a couple of "fallen flags" mixed in this train. First one to pass by was a Rio Grande hopper wearing RBMX markings. Two boxcars from the northwest corner of the United States also passed by. The first one was still wearing Oregon Northwestern RR; and finally, bringing up this train's marker was a Seattle & North Coast boxcar. 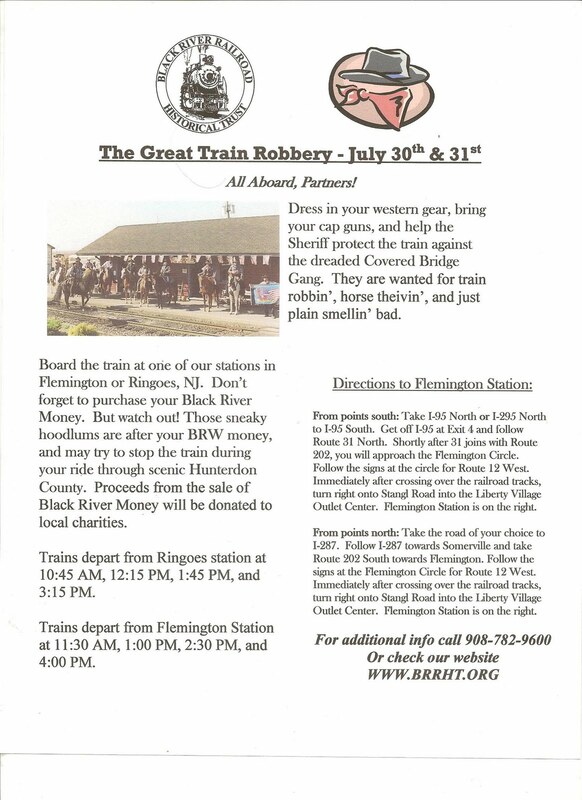 Here is your copy of the Great Train Robbery event flyer. Make a copy, or two, or three and pass it to your co-workers , friends, neighbors, anyone. You can easily help advertise this event by passing it along via e-mail as well. If we can pass jokes along to one and all, why not our flyer? This is your opportunity to excel. Note: Click on the flyer to see it full size. Use your browser's BACK button to return here. NS named one of "40 Best Companies for Diversity"
Norfolk Southern named one of "40 Best Companies for Diversity"
NORFOLK, VA. - BLACK ENTERPRISE magazine today announced that Norfolk Southern has been named to its 2011 list of the 40 Best Companies for Diversity. This is the second consecutive year that Norfolk Southern has made the list. The company was cited for the diversity of its senior management. "Norfolk Southern is proud to be recognized by BLACK ENTERPRISE magazine as a company that sets the standard in diversity for American businesses," said Cindy Earhart, vice president human resources. "We recognize that a diverse workforce and inclusive business practices provide us with a competitive advantage and are keys to our future success. 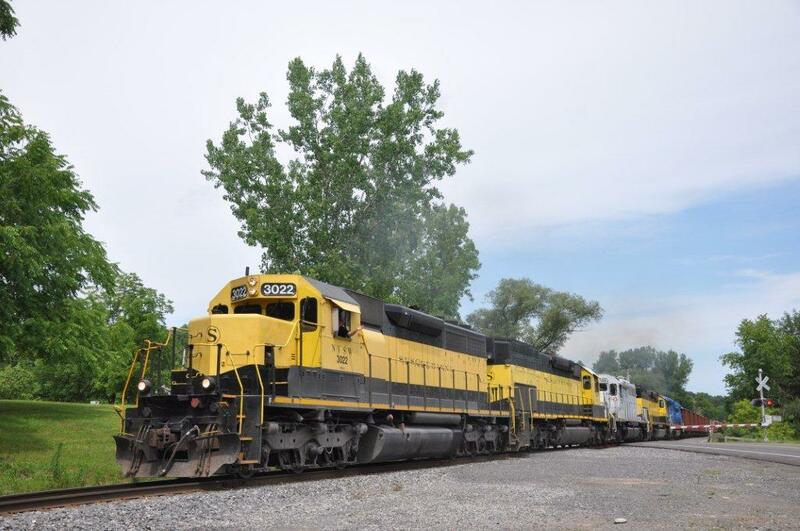 At Norfolk Southern, our employees are our most valued asset. We have many programs and processes in place to assist us with developing and leveraging the diversity of talent within our organization." BLACK ENTERPRISE's seventh annual list is based on the results of a survey of 1,000 major publicly traded corporations and 100 leading global companies with significant U.S. operations. The survey focused on the overall participation of African Americans and members of other ethnic minority groups in four areas: board representation, employee base, senior management, and supplier diversity. NS has been recognized as a leader in workplace practices by other publications. G.I. 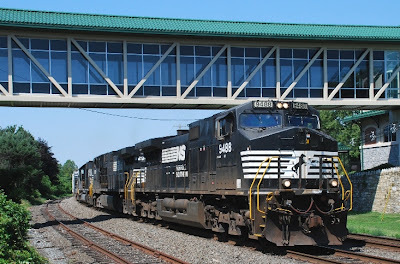 Jobs magazine ranked Norfolk Southern among the top 20 companies in its America's Top 100 "Military Friendly Employers" list for 2011, and BusinessWeek magazine named Norfolk Southern as one of the 50 Best Places to Launch a Career in 2010. The U.S. Navy Reserve has recognized the company for outstanding support of employees serving in the reserves. 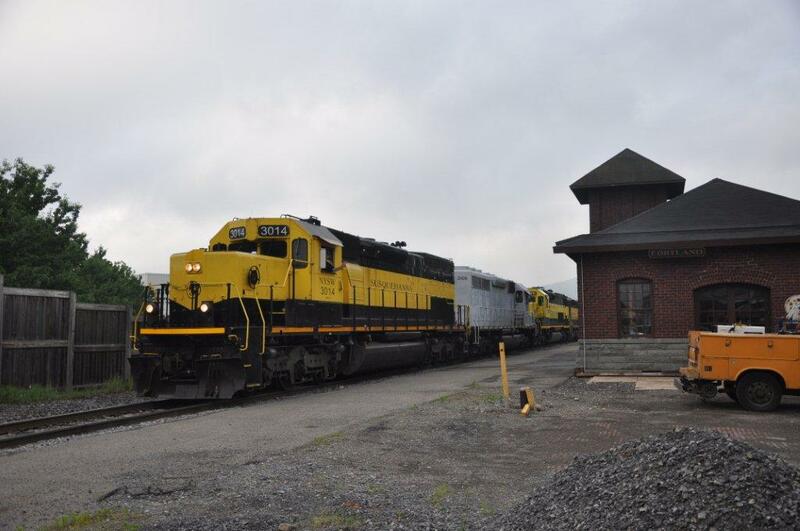 NORFOLK, VA. - During eight days earlier this month, Norfolk Southern completed $16.2 million in track, bridge, and signal improvements in southwestern Pennsylvania's Monongahela Valley. 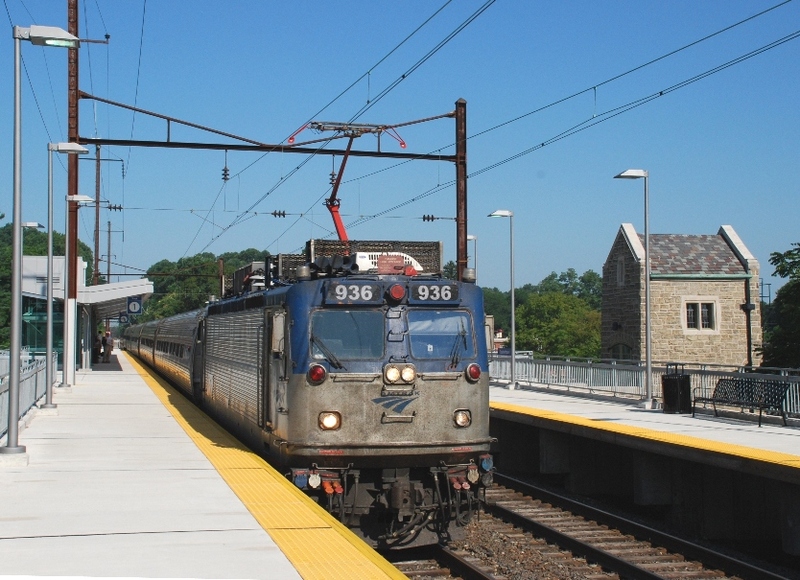 The rail infrastructure improvements are critical to the region's coal-mining industry and to meeting the electricity needs of households and businesses across the Northeast and Midwest. 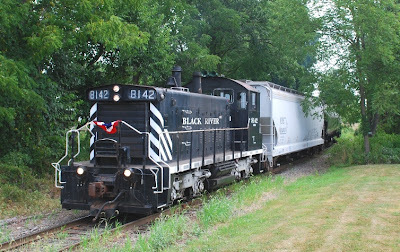 Some 30 trains daily operate on Norfolk Southern's Mon Valley rail network, which serves five coal mines that shipped 41.4 million tons of coal in 2010. "The coal industry in that part of the country is vital to jobs and to U.S. energy security, and it's essential that we maintain and improve our track infrastructure to provide solid and dependable service," said Tim Drake, NS' vice president engineering. For many years in early July, the railroad has undertaken an intensive effort to overhaul the Mon Valley rail lines during the coal miners' annual summer break, July 3-10. This year more than 400 NS maintenance of way and structures department employees from across the railroad's 22-state system laid 29 miles of new rail, resurfaced nearly 69 miles of track, and replaced three bridge decks, among other improvements. Four work trains and 95 pieces of large machinery were used. Under normal operating conditions, the work would have taken approximately three months to complete, with significant disruptions in service. "There's an extraordinary amount of planning, organization, and teamwork that goes into making this a success," Drake said. "Our employees worked under extreme conditions and hot weather and did it safely." "It's amazing the amount of work that gets done in such a short amount of time," said Butch Phillips, an NS track laborer from Waynesburg, Pa., who participated. "We take a lot of pride in it." "It's a big makeover, like a facelift," said Drew Laird, an NS machine operator. "We want to put the track in the condition required to move the trains faster and safer." Drake said the Mon Valley project is an example of how NS is investing in its rail infrastructure to support jobs and the nation's economic recovery. What a catch!! My son, Jon, finally pulled off recording what so many (including me) have long tried to do, but mostly have never even seen, let alone photographed! While I have witnessed freight cars in moving trains passing over/under one another at Conneaut a number of times (and I have been on an N&W unit leading across that trestle above a B&LE train when I was accompanying High & Wides in the early Eighties), I have never caught a nice over/under 'power meet', there. And, Jonathan and his Nikon D5000 put it into pixels. All GE power, upstairs; all EMD, down below. Nice reflection of both roads off the creek's mirror surface, too. Some guys have all the 'luck'! Note: follow the links to the picture, then click on the magnifying glass on the right above the photo, and then click on "View all sizes" at top right of screen to see this shot at maximum size. 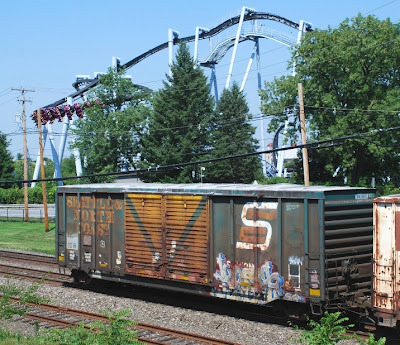 ... Is a place that is worth more than a passing visit for any railroad enthusiast that visits Medina. The museum has an extensive collection of railroad memorabilia and a fire fighting exhibit that includes an estimated 400 fire helmets. These are only two of the many exhibits on display. All of this is housed in one of the largest (301 ft. by 34 ft.) last surviving wooden freight depots in the United States. The depot was built in 1905 by the NYC Railroad. 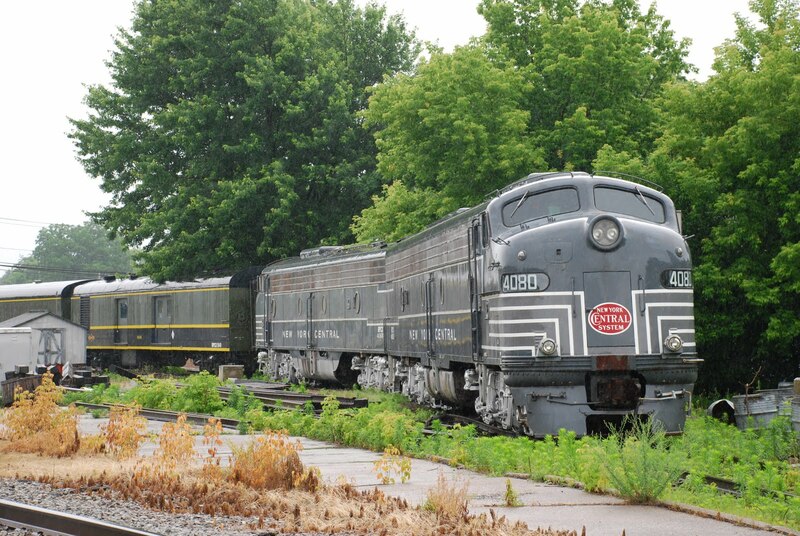 Adjacent to the depot on a siding is New York Central E-8 diesel locomotives NYC 4068 and NYC 4080 heralding a rich railroading heritage associated with this museum. 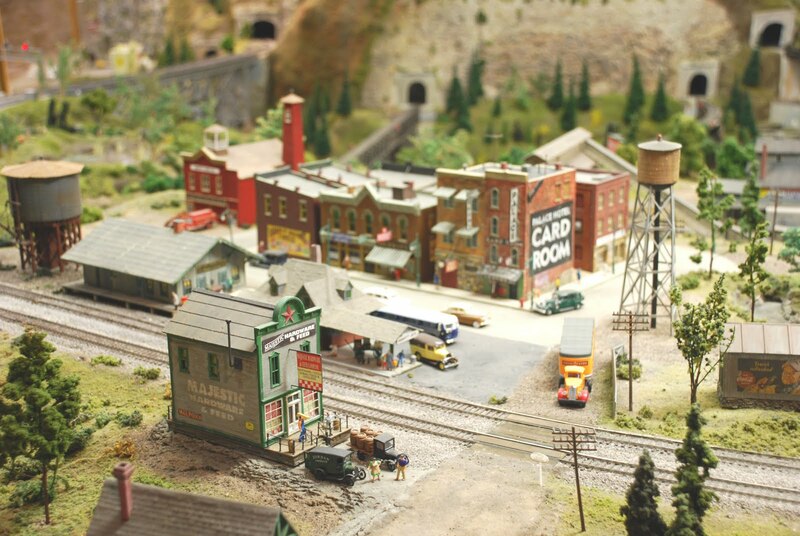 Other static displays found within include Lionel's 1928 "The States" train set in standard gauge, a collection of scratch-built, scale model ships, model warplanes, Bell aircraft and a showcase that contains over 200 scale model ships from World Wars I and II. Whatever one’s interests are in modeling, this museum certainly has it. My favorite display was what I considered the main reason for visiting Medina’s railroad museum. It was the 204 foot long by 14 foot wide HO train layout. Museum director Martin Phelps and a group of dedicated volunteers have made what I considered one of the most realistic layouts I have seen. At times deciding what to look at first on this layout was overwhelming for a first time visitor like me. It definitely was easy to overlook something. There were some scenes that rated as my favorites. One in particular was the iron ore ship Edmund Fitzgerald docked and being loaded. This was the ship that sank on November 10, 1975 in Lake Superior. Its final voyage was sung about by Gordon Lightfoot in his ballad “The Wreck of the Edmund Fitzgerald”. Perhaps those iron ore railroad cars I saw on the dock were loading the “Fitz” for its final voyage from Superior (WI) with 26,116 long tons of taconite ore pellets. Trains that were operating during my visit passed through a variety of landscapes, bridges built over wide chasms, through tunnels, farmlands, small towns, massive freight yards and cities. The buildings that populated these various landscapes exhibited a great amount of detailing, patience and perseverance in constructing each structure by the person who built them. Looking at some of these dwellings also provided me with some modeling ideas that I hope to incorporate for my own layout. What does it take to make the museum’s trains run as smoothly as they do? Here are some of the track specifics: 800 feet of code 83 mainline track, 200 feet of branch lines, 100 feet harbor line, 100 feet 4-track siding (receiving / departure tracks), 75 feet hidden staging (12 tracks, 100 cars per a track) and 28 track hump/classification yard. Signals, switches and turnouts are as follows: twenty custom built signal bridges / ninety-five searchlight signal heads and one dual arm semaphore signal mast. There are also 250 turnouts (Code 83 Shinohara and MicroEngineering) and 250 Tortoise Switch Motors. Decoders are: NCE, MRC, DIGITRAX and QSI. 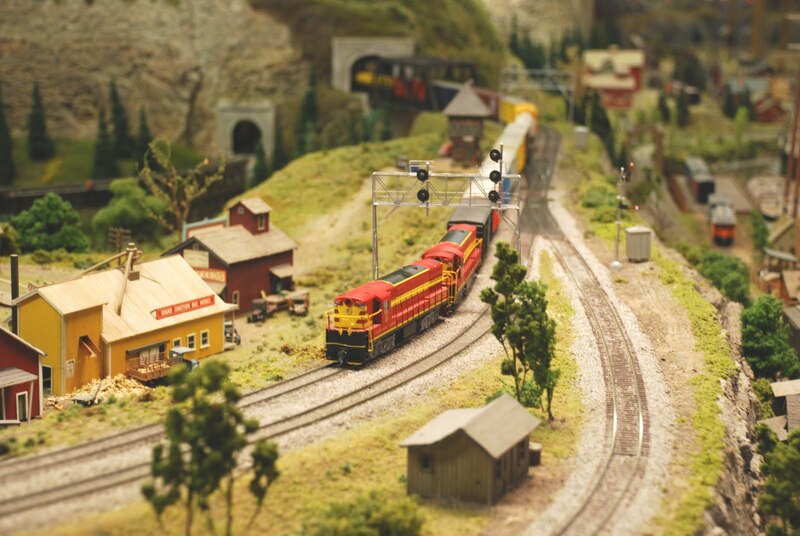 The software used to run this entire operation is Java Model Railroad Interface (JMRI) and Decoder Pro. This is a museum I would highly recommend visiting should one be in the Medina area. The museum’s hours of operation are 11 AM to 5 PM on Tuesday through Sunday. Perhaps you to might also be fortunate to receive an invitation from museum director Martin Phelps like I did to have a cup of coffee while talking about the various aspects of railroading, whether it be real or HO trains. The coffee was good and our conversation was even more enjoyable! Note: Medina, NY is located between Buffalo and Rochester, about 15 miles north of I90 and 10 miles south of the shore of Lake Ontario. Saturday morning found me heading down to Belle Mead to check on the progress of the Route 206 brigde construction project. Not much has changed since my last visit as progress is slow but inevitable. A few minutes pass and I see a northbound headlight approaching my location. Hmmm... must be CSX's Q300 heading to Manville to drop off or pick up some cars. My scanner soon informs me of my incorrect assumption with the annoucemnt "K634, Belle Mead...". It is an ethanol train that orginated in Bensenville, IL and is headed for Sewaren, NJ. 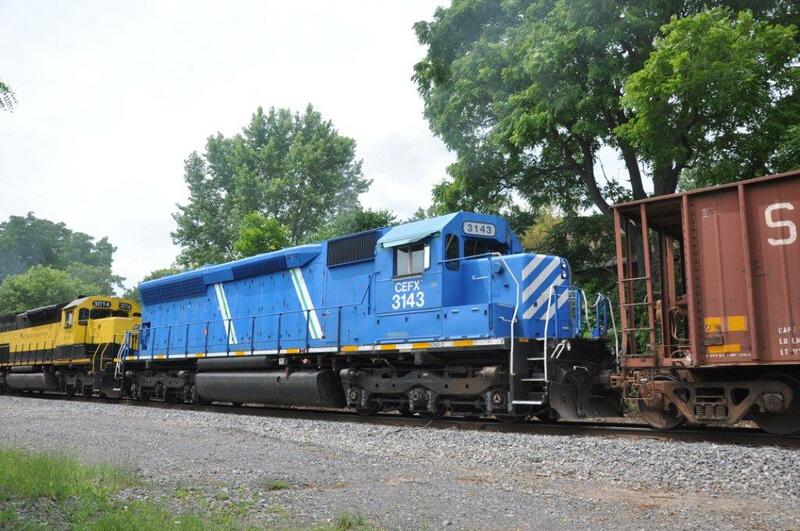 This was a reroute due to CSX's train accident in East Syracuse, NY on Wednesday. The crash happened shortly before 12:30 p.m on Wednesday July 6th. One train reportedly rear-ended another, and some train cars were jammed together and are partially resting on top of each other. 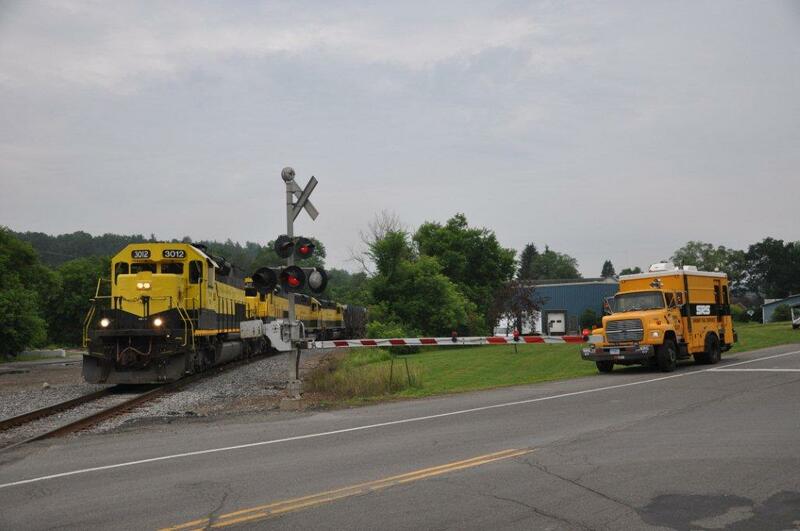 CSX spokesman Bob Sullivan said one train was travelling from Cincinnati to Selkirk, New York with two locomotives and 58 freight cars. That train was hit from behind by a second train headed from Chicago to South Kearney, New Jersey, carrying two engines and 46 cars. A total of two locomotives and four freight cars were dislodged from the tracks. Both trains were headed in the same direction. Seen here bringing its consist north at 47 mph is CSX 7340 followed by CSX 55, Dakota, Minnesota & Eastern (DM&E) 6094 and Iowa Chicago & Eastern "City of Algona" (ICE) 6216. The Southbound train bound for New Jersey was photographed today (7-7-11) at Jamesville Lake, NY with these two leasors on-line in consist. Note: Kermit works for Sperry Rail Services. Gone are the days that you could count on a matched Yellow Jacket power set on the SU99/100 trains. 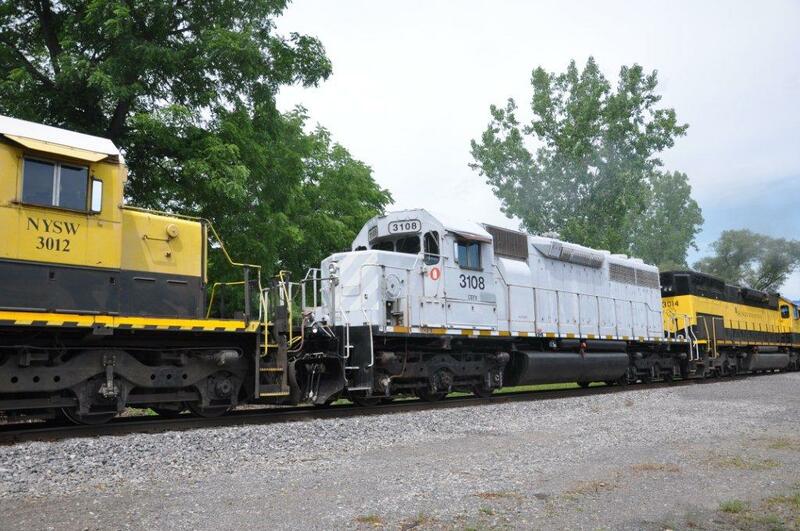 Yesterday (Wednesday, 7-6-11) NYSW took delivery of 4 CEFX leasor SD40-2's and one HLCX GP38-2. It didn't take long for them to start using them as my next email will show. So enjoy these 4 scenes just taken with-in the past two weeks during our pilgrimage up the NYSW from Little Ferry to Syracuse with the Sperry Car #817. The push for renewable energy is changing what railroads are hauling. CSX Q418 (Pavonia, NJ to Selkirk, NY) is seen coming off of the Trenton Line onto CR’s LEHL in Bridgewater, NJ on July 2, 2011. 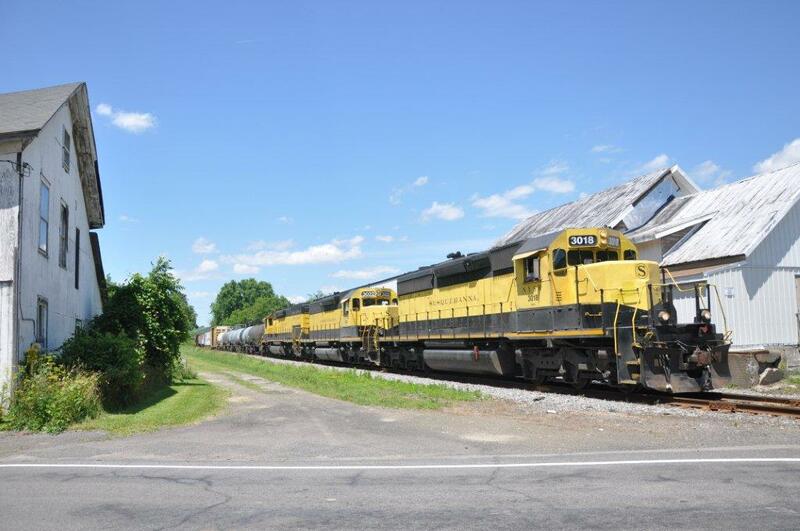 The leader is CSX’s 5107 (AC44CW), a/k/a “The William Thomas Rice Special”, and an unidentified second CSX diesel. Behind the motive power are a number of flatcars carrying some components for wind turbines. 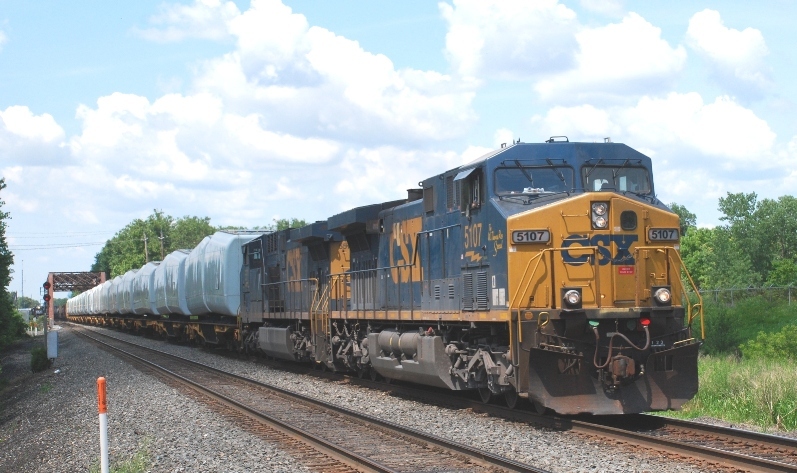 2005 marked the first year CSX started to record these types of shipments. 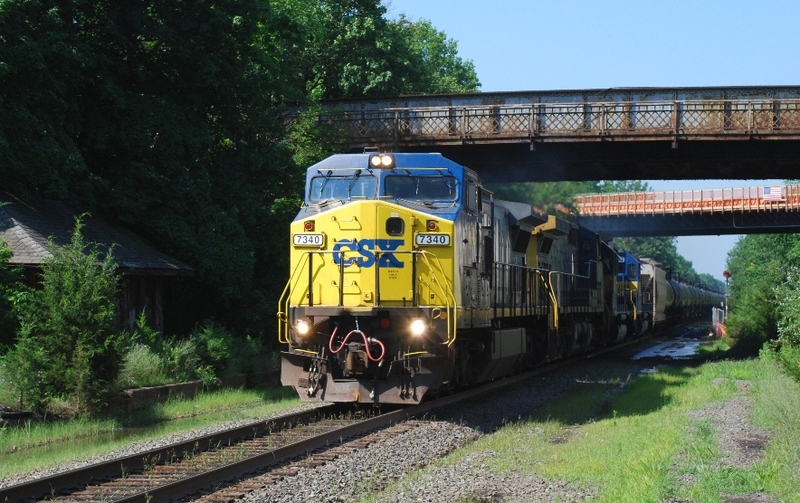 Since 2007, this has proven to be a steadily emerging market for CSX. 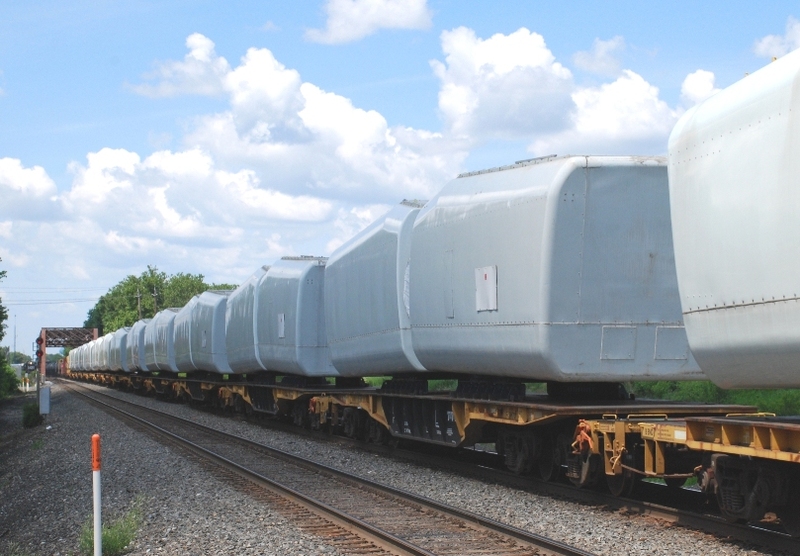 Wind components shipped by rail are categorized as blades, tower sections, hubs and nacelles. The shrouded objects seen here on Q418 are nacelles. This item houses the main shaft, gear box and generator. Average dimensions for a nacelle can be twelve feet wide by twenty feet long. On a percentage basis order, tower sections represent over fifty percent of all the wind turbine components transported by CSX. Towers seen most frequently here in the United States are about 260 feet high and are cylindrical in shape. The second most frequently shipped component by rail are nacelles, followed by the 148 foot long blades and lastly are the wind turbine hubs. CSX forecasts for 2011 are estimating a total of 2,000 carloads for all these components. We cordially invite you to join us on Tuesday, July 26, 2011, at 4:30 p.m. EST to review our second-quarter results. We will issue earnings results shortly after market close on July 26. For those interested in participating, we will broadcast via teleconference that will be available by dialing 877-869-3847 several minutes prior to the start of the call. At the conclusion, you may listen to an audio replay, which will be available until August 2, 2011. The replay number is 877-660-6853, using PIN 2861, and access code 375325. 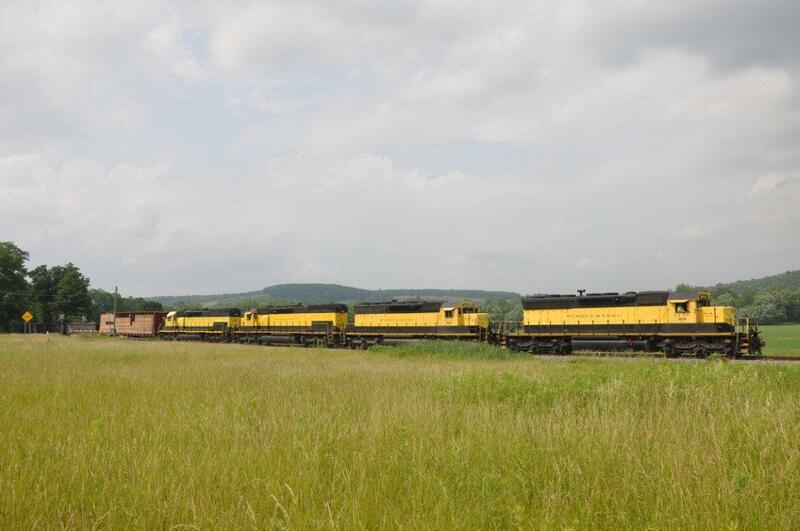 In conjunction with the call, a live webcast will be accessible and presentation materials will be posted on the company's web site at http://www.nscorp.com/ under the Investors section. Following the earnings call, an Internet replay of the presentation will be archived on the company's web site. In addition, the replay will be available for download to a portable audio player or computer as a MP3 - or podcast - file. Both the replay and MP3 file can be found at http://www.nscorp.com/ in the Investors section.